On this day in 1777, around midnight, British General Lord Grey and his troops performed a barbaric attack on Paoli’s General Anthony Wayne and his troops as the patriots waited in a Paoli farm hoping to ambush the British who were camped in nearby Tredyffrin. 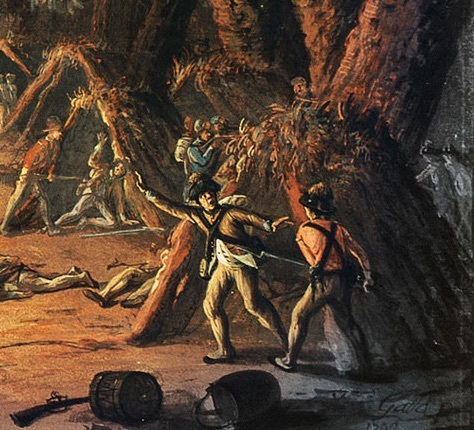 Using only their bayonets, 53 patriots were killed and over 100 wounded. Local residents were horrified as they surveyed the battlefield, which included some of their home town boys who were serving in Gen. Wayne’s regiments. The patriots remembered this horrible night with cries of “Remember Paoli!” In future battles. The Paoli Battlefield site and historical markets are in today’s Malvern, where a battle reenactment occurs annually. Also called “Wayne’s Affair”, Gen. Wayne asked for a court martial hearing to clear his name from charges that he failed to heed warnings about the nighttime Redcoat attack. His name was cleared. Join me as we commemorate the Battle of Paoli/Paoli Massacre on Sat. 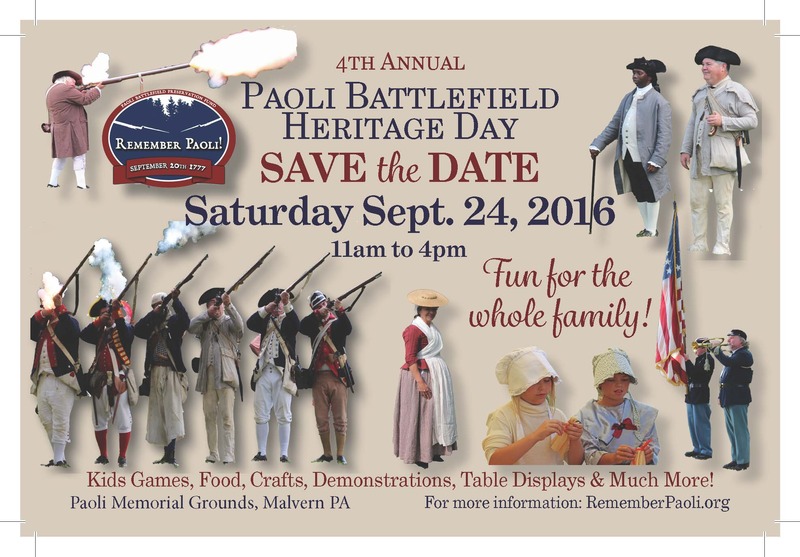 9/24, 11am – 4pm, Paoli Battlefield Historical Park, 1st &Wayne Aves., Malvern, PA. The sponsor, Paoli Battlefield Historical Heritage Society says of the event: “Join us on Saturday, September 24th 2016 as we present our 4th annual Paoli Battlefield Heritage Day, featuring our Military Timeline starting at the French and Indian War and going through to present day. With the help of our friends from Historical Military Impressions and the PA National Guard see re-enactors from the French and Indian War, the Revolutionary War, the War of 1812, The Civil War, The Spanish American War, World War I, World War II, and today’s conflicts in camps and displaying the dress and items they carried into battle. Interact with the soldiers, see the weapons they used and learn about the clothing and other gear that these soldiers needed to outfit themselves on the battlefield. Live firing exercises will take place throughout the day, as well as many other programs.” See the full page of events here. See you Saturday. Remember Paoli! This entry was posted in Uncategorized on September 21, 2016 by Sheilah Vance.